Students learn about the giving of the Torah to the Jewish people and become involved in recreating this Torah portion. Shavuot is one of the three historic Jewish harvest festivals. The name Shavuot means ‘weeks’ because it falls 7 weeks after the 2nd day of Pesach. On Shavuot, we celebrate the time that the Torah was given to the Jewish people on Mount Sinai. Moses came down from the mountain and presented the Ten Commandments to B’nei Yisrael, the Children of Israel. In Biblical times, Shavuot was also the time when the Jewish people harvested their wheat crop and began harvesting their fruit crops. An important part of the celebration of Shavuot in those times was the ceremony of bringing the "first fruits", or bikkurim, of the harvest to the Temple as an offering of thanks to God. The bikkurim were carried to Jerusalem in beautiful baskets. When the families arrived at the Temple, they gave their offerings to the priests who would bless them. The Torah is God’s great gift to the Jewish people. Through the study of Torah, we learn a set of relevant values and are provided with the opportunity to discuss sensitive feelings and issues. Torah study for the young child should be vibrant and exciting. The Torah is filled with wonderful lessons, fabulous personalities, and enthralling events. Children learn by doing. 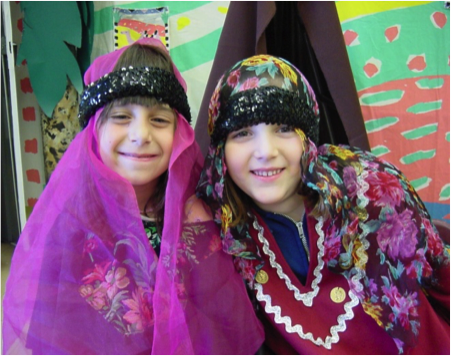 The children readily identify with the Biblical figures and the Torah comes alive as the children become active participants in the Torah lessons. Young children love stories. 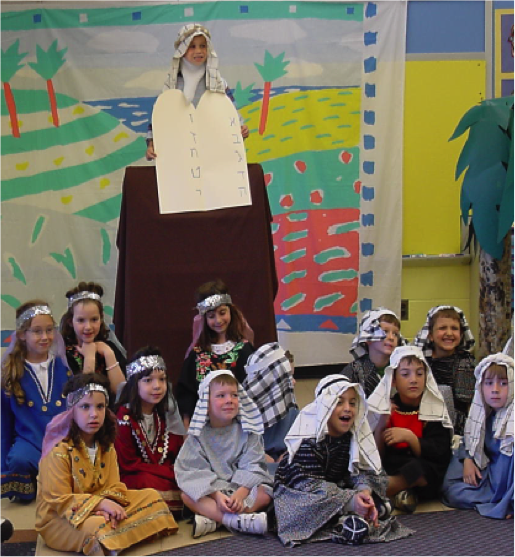 By recreating the lessons from the Torah through their own dramatization, the young students make it their own. If we imbue in our children, a love of Torah study, the children are likely to develop a sense of the Torah as an integral part of their everyday lives. 2. Bring short sides together, folding in half. 3. Cut small semi circle for head opening on folded edge. 4. Cut a slit on folded side, 1” from each edge. 5. Continue to cut or tear down fabric for approximately 10”. 6. Knot the ties to close the sides and form a robe. For purposes of dramatizing the lesson, the teacher will be the Narrator or facilitator of the story. 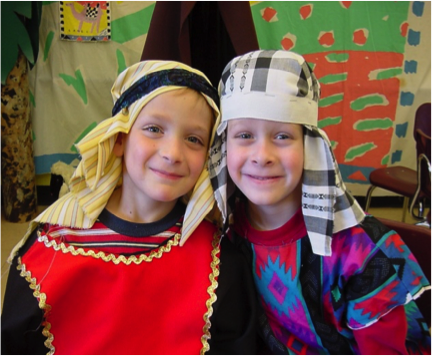 After reviewing the appropriate materials and gathering the necessary costumes, scenery, props, etc, the teacher will help the children dress as specific personalities and bring the individuals into the scene as the story unfolds. As the story is told by the teacher, the children will follow the action in mime and movement. The teacher may elicit dialogue through prompting, questioning, and directing. Generally, however, the teacher will need to recite all speaking parts, touching or looking at the person who would be doing the speaking. You may use the suggested dialogue/narration or create your own, trying to remain true to the text. The scene begins with all of the children, B’nei Yisrael, assembled around the base of the mountain. Narrator: Three months have passed since B’nei Yisrael have left Mitzrayim. They have entered the wilderness of Sinai. They set up camp at the bottom of the mountain. Narrator: Moshe climbs up the mountain to God, and God calls to him from the mountain. Moshe: I spoke with God and you have heard God’s words. What shall I tell God? Narrator: B’nei Yisrael answered, saying, “All that God has said, we will do”. Moshe: God, B’nei Yisrael has said, “All that God has said, we will do”. God: Moshe, “I will come to you in a thick cloud so all the people will hear when I speak with you, and then they will trust you forever. Moshe: B’nei Yisrael, you need to come to the bottom of the mountain to meet God. God: Moshe, come up the mountain so I may speak to you and then you will give My words to B’nei Yisrael. "1. I am the Lord your God who brought you out of the land of Egypt, out of slavery. 2. You will not pray to any other god but Me. You will not make idols. You will not bow down to idols. 3. Do not ask God to do something bad to someone else. 4. Remember Shabbat and keep it holy. You may work for six days and do all your work, but on the seventh day you must rest. 5. Honor (listen to) you father and your mother. 6. Do not murder (kill). 10. Do not be jealous of something your neighbor or friend has." Narrator: Bnei Yisrael learns to live by these rules as they continue their journey to the Promised Land. You may want to play the song, “The Promise”, The World of Your Dreams, by Debbie Friedman. •	If we didn’t have rules, what would happen? •	Which of the Commandments talk about a person’s relationship (connection) with God? •	Which of the Commandments talk about how a person treats members of his or her family? •	Which of the Commandments talk about how people treat other people? •	If you could add an eleventh commandment, what would it be? Holding the blue paper vertically, children may draw a large mountain, Har Sinai, leaving about 2” free at the top. Draw as many people, B’nei Yisrael, as desired at the base of the mountain. “Paint” the mountain with glue. Apply sand like glitter. Illustrate Moshe holding the 10 Commandments on the white rectangle. Cut out and affix it to the craft stick. Cut a horizontal slit toward the top of the mountain. Children will hold Moshe behind the picture and watch him climb to the top of Har Sinai as they push him through the slit from the back of the blue paper. Children may draw and affix a large mountain, Har Sinai, using butcher paper. On a small piece of white paper, each child may draw him or herself as one of B’nei Yisrael, and affix the picture at the base of the mountain. Illustrate Moshe holding the 10 Commandments. Add smoke and lightning. It is traditional to eat dairy foods that are made from milk, such as kugel and blintzes.. What s the reason for this? One answer is that the Torah is compared to milk, as the verse says, "Like honey and milk [the Torah] lies under your tongue" (Song of Songs 4:11). Just as the body of a human being, such as a nursing baby, can be sustained by milk, the Torah also provides all the “spiritual nourishment” necessary for the human soul. 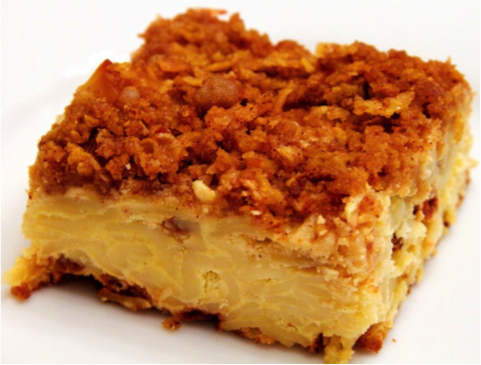 Noodle Kugel- This kugel is a staple in my family! In a large bowl, mix all 7 ingredients. In a zipped plastic bag, mix the topping ingredients by ‘massaging’ the bag and sprinkle evenly over the two pans. Bake at 350 for 45-50 min. The Israeli folk dance, Shibolet Basadeh, is traditionally performed during the Omer Ceremony (common on kibbutzim) in Israel. It is a revival of an ancient ritual when the first sheaves of barley were cut in the fields and presented to the Holy Temple. Involve students in dancing the Shibolet Basadeh. Formation:	Circle, arms extended at shoulder lever, palms touching. *7-8 Jump, jump (in place). No turning. 17-20	Face Center. 2 step hops fwd (RL). Raise arms. 27-28	Stamp L in place. Resume original hand position. The story of how God determines from which mountain He will address the Jewish people and give them laws to follow. The reader will learn that Mt. Sinai was chosen for the way that Mt. Sinai behaved with humility and trust. The Eleventh Commandment The Children Of America The Children Of America “If there were an Eleventh Commandment, what would it be?” Children of many religious denominations across America answer this question—in their own drawings and words—in The 11th Commandment. This full-color collection of “Eleventh Commandments” reveals kids' ideas about how people should respond to God. A Mountain of Blintzes Barbara Diamond Goldin Anik McGrory A family living in the Catskill Mountains in the 1920s works together to gather the necessary ingredients to make blintzes for Shavuot. Who Knows Ten: Children's Tales of the Ten Commandments Molly Cone Robin Brickman A favorite of parents and children alike, Molly Cone's stories illustrate the deep and hidden meanings of the Ten Commandments. Each chapter begins with a commandment and contains a simple yet elegant tale of timeless truth. Young readers will discover fresh meaning in the Ten Commandments, learning about life, how to live it well, and what is good. Sadie and the Big Mountain Jamie S. Korngold Julie Fortenberry When her preschool plans a Shavuot hike just like Moses took up Mt. Sinai, Sadie is afraid she is too little to make it to the top, and tries to think of ways to be absent. But when the day comes, she learns that anyone can climb high enough to reach God. For more lessons of this genre, see “Torah Alive! An Early Childhood Torah Curriculum” published by URJ Press / Behrman House.